Cross-Reactivity (Details) There is no detectable cross-reactivity with other relevant proteins. Protein Function: Cytokine that stimulates the growth and differentiation of hematopoietic precursor cells from various lineages, including granulocytes, macrophages, eosinophils and erythrocytes. Background: Granulocyte-macrophage colony-stimulating factor(GM-CSF) is also symbolized CSF2. Human GM-CSF is a glycoprotein that is essential for the in vitro proliferation and differentiation of precursor cells into mature granulocytes and macrophages. The human cDNA clones contain a single open-reading frame encoding a protein of 144 amino acids with a predicted molecular mass of 16,293 daltons and show 69 % nucleotide homology and 54 % amino acid homology to mouse GM-CSF. The gene for human GM-CSF appears to exist as a single-copy gene. Human GM-CSF is a 22,000-dalton glycoprotein that stimulates the growth of myeloid progenitor cells and acts directly on mature neutrophils. The GM-CSF gene is localized by somatic cell hybrid analysis and in situ hybridization to human chromosome region 5q21-5q32, which is involved in interstitial deletions in the 5q- syndrome and acute myelogenous leukemia. A complementary DNA for the T lymphocyte-derived lymphokine, GM-CSF has been cloned, and recombinant GM-CSF protein has been expressed in yeast and purified to homogeneity. This purified human recombinant GM-CSF stimulates peripheral blood monocytes in vitro to become cytotoxic for the malignant melanoma cell line A375. Application Notes Before using Kit, spin tubes and bring down all components to bottom of tube. 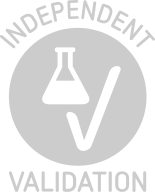 Duplicate well assay was recommended for both standard and sample testing. Sequence similarities: Belongs to the GM-CSF family. 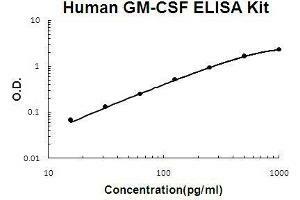 Protocol human GM-CSF ELISA Kit was based on standard sandwich enzyme-linked immune-sorbent assay technology. A monoclonal antibody from mouse specific for GM-CSF has been precoated onto 96-well plates. Standards(E.coli, A18-E144) and test samples are added to the wells, a biotinylated detection polyclonal antibody from goat specific for GM-CSF is added subsequently and then followed by washing with PBS or TBS buffer. Avidin-Biotin-Peroxidase Complex was added and unbound conjugates were washed away with PBS or TBS buffer. HRP substrate TMB was used to visualize HRP enzymatic reaction. TMB was catalyzed by HRP to produce a blue color product that changed into yellow after adding acidic stop solution. The density of yellow is proportional to the human GM-CSF amount of sample captured in plate. Aliquot 0.1 mL per well of the 1000pg/mL, 500pg/mL, 250pg/mL, 125pg/mL, 62.5pg/mL, 31.2pg/mL, 15.6pg/mL human GM-CSF standard solutions into the precoated 96-well plate. Add 0.1 mL of the sample diluent buffer into the control well (Zero well). Add 0.1 mL of each properly diluted sample of human cell culture supernates, serum or plasma(heparin, EDTA, citrate) to each empty well. See "Sample Dilution Guideline" above for details. It is recommended that each human GM-CSF standard solution and each sample be measured in duplicate. Handling Advice Avoid multiple freeze-thaw cycles. Background publications Grabstein, Urdal, Tushinski, Mochizuki, Price, Cantrell, Gillis, Conlon: "Induction of macrophage tumoricidal activity by granulocyte-macrophage colony-stimulating factor." in: Science (New York, N.Y.), Vol. 232, Issue 4749, pp. 506-8, 1986 (PubMed). Huebner, Isobe, Croce, Golde, Kaufman, Gasson: "The human gene encoding GM-CSF is at 5q21-q32, the chromosome region deleted in the 5q- anomaly." in: Science (New York, N.Y.), Vol. 230, Issue 4731, pp. 1282-5, 1986 (PubMed).